You can buy How to Host a Murder or other series in gift stores for $20-30. For big events with big budgets, high-end companies run mysteries for up to 200 guests, using actors as guides. But most publishers, such as the long-running Mysteries by Vincent, are one-writer operations, a cottage industry selling low-end .PDF packages as web downloads or by mail order. Mary Lee, who runs Dinner and a Murder, is a work-at-home mom in Tennessee. It beats stuffing envelopes. It seems few of these people belong to our gaming culture, though famed German boardgame designer Reiner Knizia tried a "movie-making party game," Hollywood Lives. Another exception is Freeform Games, founded by Steve Hatherley, who used to write for Call of Cthulhu. And How to Host a Murder produced one backward connection. Decipher founded the line (and the entire category) in 1984, and its success prompted the company to try a licensed Star Trek How to Host a Mystery game. By most accounts, the game turned out lame, but it did open a connection to Paramount's licensing department, which eventually led to Decipher's Star Trek Customizable Card Game. Decipher later produced a popular Star Wars card game and Lord of the Rings card and roleplaying games. But many of these designers started as mystery fans who never once played D&D or Warhammer. They're gamers by convergent evolution, outwardly similar but with weird alien innards. 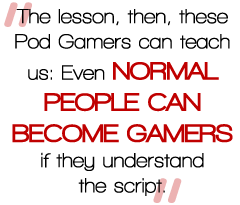 Where did these Pod Gamers arise? The ancestral spawning ground of murder party designers, the antecedent they invoke repeatedly on their websites, is, yes, Clue. Invented during World War II by British law clerk Anthony Pratt and republished by Parker Brothers in 1949, Clue (or, in the U.K., Cluedo) has sold over 150 million copies. Many mystery games predate Clue; for instance, The Jury Box, from 1935, is one of several "dossier" games from that era, though these are technically deductive puzzles. But Clue is the most pervasive embodiment of the British Teacup style of mystery favored by murder party games, as opposed to Hard-Boiled Noir. Hasbro, owner of Parker Brothers, has aggressively prodded the Clue property in many directions, including rebrandings (The Simpsons, Dungeons & Dragons, Scooby Doo) and over a dozen spinoffs: VCR Mystery Game, DVD Game, Jr., Master Detective, Mysteries, Card Game, Great Museum Caper, Pirate Treasure Hunt and Little Detective Color Matching Mystery. In our hobby, Clue is (after Risk and possibly Stratego) the best regarded - rather, the least badly regarded - of the Parker Brothers/Milton Bradley classics. But gamers favor a wider range of board, card and pick-a-path detective games: Scotland Yard, Sherlock Holmes Consulting Detective / Gumshoe, Mystery of the Abbey, Orient Express and many more. Boardgamegeek has tagged 400 games "murder mystery," though this includes weakly themed "detective" games like Mystery Rummy and - hey! - four dozen murder party games. None of these alternatives will ever replace Clue, obviously. Never mind its 150-million copy head start; aside from their complexity, these mystery games have design problems inherent in games of deduction: repetitive strategy, limited replayability and contrived interaction between players. They have another feature in common: Aunt Ethel won't play them. Ever.